Xander Parish is the only British dancer with the Mariinsky Ballet. 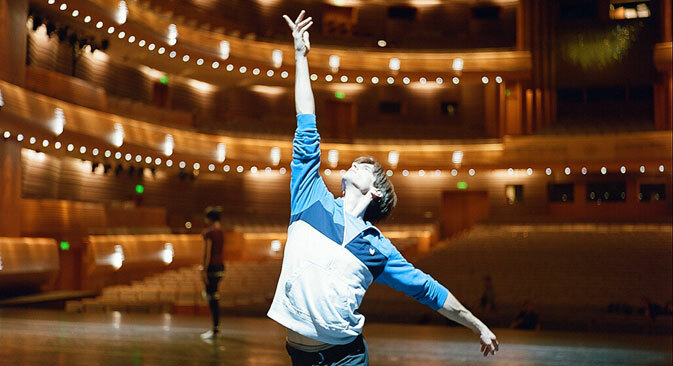 In London for the company’s Summer Season at the Royal Opera, he reveals what he has learned about Russia and Russian ballet during his time in St Petersburg. The Mariinsky Ballet Summer Season, a series of five different shows running until August 16 at the Royal Opera House in London, began on July 28 with Leonid Lavrovsky’s classical ballet for Romeo and Juliet. On stage, Romeo was brought back to life for a few hours, only to perish once again after enduring the bliss and tragedy of love. To lend his face, muscles and charm to the Shakespearian hero was Xander Parish, the first Briton to become principal at the Mariinsky Theatre. As an Englishman with a Russian company, he defines playing the role as a “dream come true”. Years of training and passion have been essential for him to get there, in a mesmerising journey from the Royal Ballet to St Peterburg, where he arrived in 2010. Speaking to RBTH after a long day of rehearsals, he shared some thoughts on Russian ballet and his life in Russia. Russia Beyond the Headlines: What does it mean to you as a British dancer to perform with the Mariinsky at the Royal Opera House? Xander Parish: The Opera House isn’t just the most famous theatre in the UK, it’s the theatre which I grew up in. I joined the Royal Ballet School when I was 11 years old, and I must have been 13 or 14 for my first production with the Royal Ballet, The Nutcracker. I was a pageboy. Later I joined the Royal Ballet company, and from mid-19 I lived there. It was my home for 4 and a half years. Then I came to Russia. To come back to the Royal Opera House, which is my London base – I still think of it as home when I go back – is a huge deal. It’s like being back in time in a way, but with a whole different perspective. Going back, dancing in one of the principal roles, with one of the best companies in the world is incredible. And to make it more interesting, I remember going to Covent Garden to watch the Mariinsky Ballet on tour when I was at the Royal Ballet School. I was 14 or 15. I watched most of their productions, the big stars – I must have seen them all. At the time I did not know I would be dancing with them, back on that stage. RBTH: What is it like to train at a place like the Mariinsky? X.P. : The old-fashion-ness of this place is what I love dearly and that makes it so special. They are going to close the old Mariinsky in a year or two for renovation, and it brings a tear to my eye to think of it. I know it needs doing and upgrading, but at the same time it’s so special and so unique – I don’t want them to change a dot. I love the fact that the stone steps are worn down: dancers for many generations have worked and danced there, and checked in the mirrors, used the studio and been on the same floor... The history is poignant, you can feel it in the atmosphere. RBTH: What have you learned about Russia and Russians during your stay in St Petersburg? X.P. : It took me a while to figure it out. When I first came here people seemed quite cold and unfriendly, but that’s not actually the truth. Russians have a veneer – they don’t give themselves immediately. But, in a way, that makes them more genuine. Once you have their trust and they know you, you get underneath. I have some friends here now that I will have for the rest of my life. With some of them I couldn’t even communicate properly in the beginning... but we formed such strong friendships! Although that exterior that sees the Russians as cold and a bit hard is often publicised in the West, it is like looking at a cupboard and not seeing what’s inside. Maybe the cupboard is closed, but once you open it, it’s filled with awesome things. RBTH: Why do Russia and ballet go so well together? X.P. : Because the Russians have great respect for their art and their history. They preserve it in a way that’s almost faultless. They pass it down by mouth and by person, one generation to the next. There is very little room for error when it’s passed down so carefully to the next generations. The old Kirov stars are now coaches in the company. RBTH: Are there any differences between Russian and British dancers? X.P. : Comparing dancers from the Royal Ballet [to those from the Mariinsky] is like comparing a dog in Russia to a dog in the UK. Dogs are dogs, dancers are dancers. There might be different breeds of dancers, but we are all the same. Dancers here [in Russia] are trained so purely and thoroughly, and the technique is so beautiful. People in the West work very hard, but they have a certain mentality: “Ah, it’s time for my break, I deserve my weekend, I must have my holiday now”. [In Russia] they work, and work, and work; and then they work some more. And there is no stop. There are no breaks. There are no free days. You just work like it’s your calling and your art. You owe it to the art form, rather than the art form owing it to you. But I have friends who are dancers both in London and St Petersburg, and we are the same people, wherever we are. It’s just the moulds that are different. RBTH: How has Russia changed you? X.P. : I am a much broader person. I am much more open minded. Coming from the Royal Ballet system, it was like I was in a bubble. When you train at the Royal Ballet School as a kid, you are focused every day on ballet and the Royal Ballet. Once you graduate, the Royal Ballet is the only company in the world and you don’t know anything else. That was my mentality too. I didn’t know what else was out there. I didn’t know about other companies: I had to be in the Royal Ballet. I was British, it was my company and my heritage. To come to Russia has completely changed my view of things. I am so blessed to have got out of that bubble and seen the wider picture, the bigger world... It has really opened my eyes.